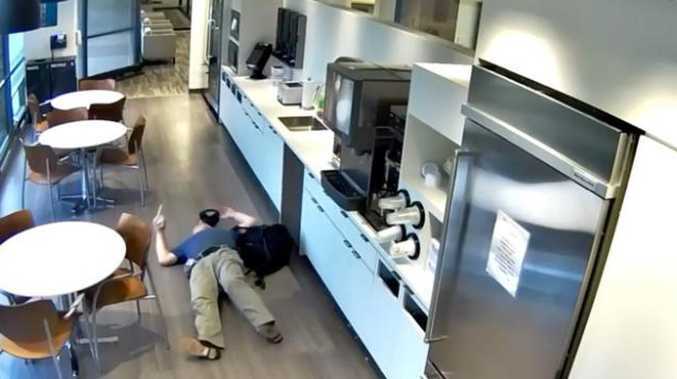 Man stages fake fall in insurance claim hoax. A New Jersey man, 57, is on thin ice with authorities after surveillance cameras captured him faking a rather pathetic fall in an insurance claim hoax at his workplace late last year. Seen in the released security footage, which has since gone viral, Alexander Goldinsky begins executing his plan by filling up a cup with ice which he then dumps on the ground and proceeds to perform the worst fake fall anyone has ever seen. According to Middlesex County Prosecutor, Andrew C. Carey, Goldinsky remained on the ground waiting for someone to find him. "The investigation revealed that Goldinsky purposefully threw ice one the floor in the cafeteria at his workplace, placed himself on the ground, and waited until he was discovered," the Prosecutor's office said. Goldinsky also filed false claims regarding the treatment he received by the ambulance service and local hospital for his injuries. "Fraudulent claims cost everyone and we will aggressively prosecute those who illegally manipulate the system," Mr Carey said. Goldinksy was arrested in his home on January 15 over the incident, but remains adamant it wasn't deliberate. But the footage speaks for itself, capturing the tumble at an unnamed company where Goldinsky was working as a contractor. Goldinsky has been charged with insurance fraud in the third degree and theft by deception in the third degree for falsely filing the claim.